Transform your favorite quote, endearing message or short verse into a magnificent work of art as a unique Christmas gift for the home this holiday season. A unique Christmas gift for the home this season, you can record any poetic quote, endearing message, short verse or other creative sound to create a breathtaking masterpiece for your loved one’s favorite nook with these one of a kind works of art from Voice Art Gallery. Choose from a wide variety of styles and color combinations to match this interesting conversation piece with the interior décor of your friends, family members and other loved ones. Let Voice Art Gallery take your voice or other interesting sound and transform it into an inspiring piece of canvas artwork that enables you to communicate with your loved one in an entirely new way. 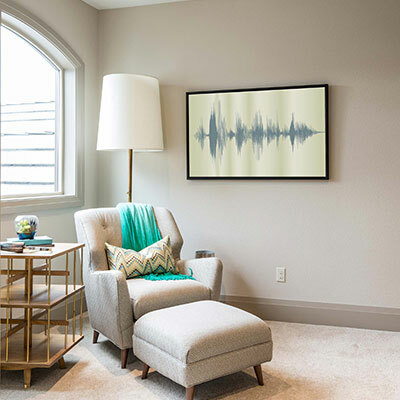 Voice Art Gallery uses innovative technology that enables seasoned artists and novices alike to create impressive artwork for their own homes and the homes of those they love.